We have many threads already for electric flight topics - indeed so many, that the beginner to leccy flight could be easily overwhelmed - thats why we started this section. All beginners are welcome - and of course we need you experienced folks also to come up with the help and answers. So I have started the ball rolling with the section and I have also created several other boards covering things such as ESCs Motors, Batteries and so on. ....otherwise we end up with stuff scattered all over the place again. Also, please do not get technical in those beginners boards. The intention here is to give the raw beginner to electric flight the basics he / she needs to get a model aeroplane up and running. We will also try to link to relevant existing articles and threads where appropriate, but frankly, there are so many that this may be very difficult to accomplish without overstretching the thread. Any attempt to hijack the thread, stray off topic, or flood the boards with complicated and technical jargon will be stopped without further warning, and the aim remains to keep the thread informative, yet not overly long, so also please be aware that we shall be ruthless with chopping out un-necessary "wafflings" which will only make the section more difficult for beginners to get to grips with. As mentioned, we have another sections for more detailed and advanced discussionon electric flight. I do hope that we can rely on useful and appropriate material from our many members. Right lets remind ourselves that this is a “Dummys Guide” to getting an electric aeroplane in the air, and therefore considerable licence is used in order to simplify things - many generalisations will be made, and doubtless some of the recommendations could be challenged, but unless someone spots a real error, lets go with the flow There are LOADS of threads already on here covering almost all the various bits of the jigsaw, and your're encouraged to read as many of them as possible - together with the various articles which have been published and on the forum.Remember too, that many electric models these days come complete with the correct motor and prop, and sometimes also the speed controller and suitable battery - so if the thought of trying to learn about all the different features and flavours available in the somewhat mysterious world of electric flight still terrifies you - thats your route. However, if you are the type who wants to get involved a little deeper, and are happy wielding a soldering iron and a multimeter then this thread is for you. We even have a section topic covering the skills required for good soldering, as well as how to use the simple wattmeter measuring device -an essential inexpensive piece of equipment in IMO and will almost certainly prevent you from releasing "the magic smoke" from your new components. Let’s start with what is needed in an electric power model aeroplane. A motor and prop, a battery, an electronic speed controller ( ESC ) and lastly the usual radio gear - 35 Mhz is fine if that’s all you have, but it has to be said that 2.4Ghz equipment does have the edge when it comes to certain electric models. Here’s a simple illustration of how it all goes together, and then we will discuss that in a little more detail. Clicking the images will enlarge them. You can see that in reality, the setup is very similar to a typical IC ( internal combustion ) model, with the battery replacing the fuel tank, the ESC replacing the throttle servo, and the motor replacing the engine. With so many different manufacturers producing thousands of different types of components - each using there own confusing series of numbers and names - its no wonder that the beginner gets stressed. Many people are looking for the holy grail of a simple chart which shows which electric motor replaces their existing IC engine but it must be said that this is not really the best way to approach the subject as electric powertrains can be more versatile than IC, indeed its this very aspect which, to my mind, should be viewed as a positive thing. However we will attempt to give some fairly simple and general guidelines about selecting items - especially motors - and the reader should then be able to go in search of something suitable from the myriad of suppliers which are out there in the market place. Remember, that several electric flight specialists exist - most of whom are happy to advise you on which product best suits your needs, so don’t be afraid to ask. If you find the response less than helpful, or patronising, then shop around until you find a supplier you like. If you are in a club, then almost all such institutions have at least one electric flight "guru" who will doubtless be only to glad to chat to you. Batteries come in all sorts of different shapes ,sizes, voltages, and capacities and these will be explored further as we move on through the thread, with again, a dedicated more detailed topic section HERE. Many motors are “named” with a confusing ( and somewhat meaningless TBH ) set of numbers and letters - these often refer to the physical dimensions such as length and diameter. Now although this information may be helpful in deciding if the unit will actually fit into the model, its not the most important information for us to help decide whats required. An electric motor has to be chosen with the following things in mind. This is not the total picture, but it’s a good start for a beginner. The power required ( just like when selecting an IC engine ) - this is "Watts"
So you see there a few decisions to be made whatever type of powerplant you choose. After all, you wouldn’t put a tiny little short stroke high revving 2 stroke engine in your ¼ scale Tiger Moth would you? Likewise, a nice big radial engine, or 200cc petrol flat-twin engine would be somewhat OTT in your foamy shockflier !! Inrunners and Outrunners and these two types are discussed in more detail over in the "Motors" section, HERE. To get you started, think of the inrunner as a fast revving motor for small props and high speed models, and the outrunner as a slower revving motor good for swinging larger props. When trying to decide on the power required for a particular model the following is a rough guide, and more detail is given in the motor thread. General sports models, older Warbirds and trainers etc 80 - 100 Watts per pound of AUW ( all up weight ). More modern Warbirds and aerobatic machines etc 120 watts per lb. Fast models, pattern ships, and jets 150 Watts per lb, with very high performance models requiring around 200 watts per lb. If you simply must try to compare the electric motor to an IC engine then another method sometimes used is the “double up add zero system”. Here you take the IC engine size ( 30 ) double it ( 60 ) and add a zero. I must stress again, that this is a simplistic explanation, and in truth, correct selection of a powertrain needs to be made with an idea of the battery you intend using also - simply trying to choose a motor in isolation without due consideration of the battery you will be using is not really the ideal method. So why not click The motors link and take a look before moving on any further. 2) Receives the throttle position commands from the receiver. Note. The normal "battery" port of the receiver is not used ( except in some special cases referred to later ). Dont worry about running the battery "flat" and losing the radio power - another clever onboard gizmo in the ESC prevents this from happening. Its called the LVC otherwise known as Low Voltage Cutoff - and ensures that even when the battery has insufficient power to run the motor, power to the radio is maintained, allowing you to safely control the model back to earth, albeit effectively "deadstick". Clever huh ! We shall be adding more info for the inquisitive types amongst you in the dedicated section topic "ESCs" - click here for the link. Also watch out for an article covering all aspects of these little marvels coming soon to a "special" edition of your favourite magazine in the early Autumn . the model will climb as long as you want with this set up........ ..
Great stuff. Just what I need. Although not a complete newbie( i have started to understand. I still have yet to get properly airbourne with any thing other than my minium kyosho cessna!!! As you can see in the example ken has listed, his 1400 Kv motor is swinging an 8" prop at 12600 RPM. With no load that motor would be theoretically spinning at 14700 RPM. 1400 ( revs per volt ..the Kv ) X 10.5v ( the battery volts ) = 14700. However loading it with a prop causes it to drop a bit in speed, - the more heavily loaded it is with bigger props, the more it drops its revs ( but consumes more current and actually produces more power ( watts ). His motor ( with that prop loading ) is pulling 24A from his 3 cell Lipo. Now although a 3 s LiPo is 12.6V when full, and often called an 11.1V battery ( its nominal or "middle line " voltage) when its under a workload, that voltage drops immediately, and in most cases that will be down to about 10.5 to 11 Volts. Therefore , the Watts ( power ) is derived from another simple sum. Amps X Volts, in this case his wattmeter - an invaluable, inexpensive and essential tool for any serious electric flyer reads 24 Amps. So his total power obtained at WOT ( Wide Open Throttle ) is 10.8v X 24a = 260 Watts. Ken doesnt say what weight his model is, but lets guess at around 2lb. This gives him a power to weight figure of approx 130 Watts per pound, which fits in rather well with my earlier guide of the amount of watts required for different model types and performance. Hope thats easy enough to understand. 1 articles Thanks Timbo. The haze is slowly clearing What about electric gliders. Does it make a difference that I want the motor to run at full power ish for 5-10 seconds to get me high and then shut the throttle so I can glide about looking for lift. Does this affect the type of powertrain you would select? Thanks both. I've picked up a cheap Junior "S" which will form the motor, fuz and tail of a hybrid using what's left of my old one (long story). I've been using the eagletree logger this evening with the motor on the bench, and it's really interesting (well ish ). The kit recommends a 30a ESC - and I know they can burst - but with a 9x6 prop on the Graupner motor, it's pulling just over 30a on full throttle. To continue this main section a little further, lets discuss some "best practice" when flying your electric model. 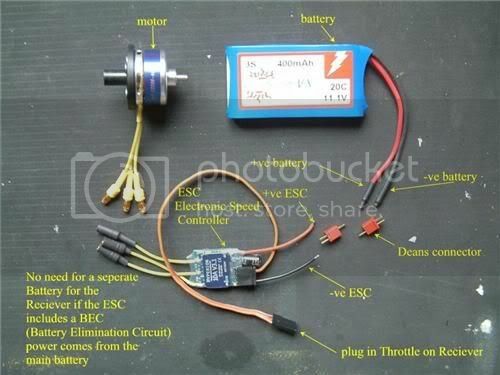 1) Do be aware, that despite ESCs having built in safety devices which prevent the motor from operating if the throttle stick is not set low on powering up, its best to be wary of this possibly happening. I never rely on, or fit switches to any of my powered electric models, preferring instead to physically plug / unplug the main battery to ensure power is definately off / on. Once "armed"its best to treat the motor and prop as "live". 2) Use a timer to limit your flights and ensure that your battery is not run down too low. From initial bench tests, I have a pretty fair idea of how long any given model is likely to fly on the battery selected. I then do the maiden flight, and watch and listen very carefully for changes in performance and motor sounds as this time approaches. Immediately I notice the revs dropping off, and sounds changing etc - I land. I then check the flight time, and if it was, say 6 minutes, then I set my Tx timer for 5 minutes on that particular model. This allows me a a safety margin for a "go around" if needed. I never fly until the ESC LVC cuts in - doing so reduces the life of the battery, and leaves little or no room for error. 15 articles 1) Many models were designed around a "speed 400" can motor because it was about the only motor available in those days! Simply replacing it with an equivalent could be missing out on the amny adavtages that the righ brushless motor can provide over and above its direct equivalent IYSWIM. 2) Due to volume of supply and demand, outrunners are usually quite a bit cheaper than inrunners, so if mountings etc can be fettled to accomodate them, outrunners are probably a better replacement. Outrunners can swing bigger props which may be a better choice on certain models...remeber that larger props are always more effiicent than smaller props. General guidelines woud be, to consider that if keeping the older style nickel batteries that probably accompanied the brushed motor, brushless will be perfectly happy with these cells too, although of course for better performance and weight reduction into the bargain a 2cell (2S) LiPo pack can often be a straight swop for the older 6 or 7 cell NiCd battery. Indeed due to weight reduction and much greater efficiency, a brushless and 2s lipo combo would probably equal or even better a previous 8 cell nickel battery. Time to chat about airframes. There is an old saying in this hobby - "add lightness", and its never been more true than with electric flight. Love it or loath it, foam is here to stay, and has much to commend it for electric models. Its light, its cheap, its relatively easy to work with, it can be painted without any covering needed ( using acrylics or other foam friendly paints -even household emulsions! ), its relatively tough - often literally bouncing upon impact rather than breaking, it can be strengthened if required with various coverings, and instant repairs are easy too using special foam friendly cyanoacrylate glues ( super glue basically ) - vital if you are a learner! Thats not to say that the more traditional materials are unsuitable - far from it, but the weight can pile on without you realising, especially if liberal with the epoxy and other similar glues. Many suitable models have emerged over the last couple of years, with some excellent offerings from the likes of Multiplex, with their "Elapor" variant of foam. Please try to resist the temptation to go straight in for that sleek looking fast EDF ( Electric Ducted Fan ) and instead start off with a nice easy slow flying high wing trainer style model. One such model is the Multiplex Mentor - a decent size wingspan of just over 5' - helps with visibility ! This model is "full house controls" which means it has ailerons also. The Mentor is available from a wide range of suppliers, including the famous and excellent Steve Webb Models. To give something back before seeking advice and following on from my thread in forum 'Electric Flight - general topics', i would comment as follows. First purchase should be an RC simulator and practice on that in the evenings for around 2 weeks and change settings such as engine failure and wind to help you get used to overcoming such issues which you will in reality, albeit in reality these things will happen ALOT quicker than on a sim! Plane choice for me was Hobbyzone Supercub LP, and i'd recommend it to anyone wanting to learn. Easy put together and flight ready you just need a field with NO WIND (i mean aboslutely none) especially on your first few runs. It will launch easily by hand and has a natural tendency to just climb and climb so much so that when at a desired height it is best operated at 1/2 or even 1/3 throttle. Frankly the anti crash is not necessary so i'd recommend turning it off but keep the plane high up and don't get over confident. Made from a pretty durable polystyrene type foam and spares seem pretty reasonably priced though worth shopping around for spare LP batteries. Only spare i have needed to buy is extra batteries. When confident (after several outings) just up the revs a little and a loop the loop is perfectly within grasp. Best flown in no wind but after a little esperience can be flown in a light breeze although still note that if flying down wind and wanting to turn in to the wind you may need a touch more throttle and alot more space. Landings are normal procedure, in to wind, throttle off and glide in using elevator, allow pleanty of room! As mentioned: i feel ready for the next step and have a thread in 'Electric Flight - General Topics' asking for next plane suggestions. If you've a suggestion for me i'd love to hear it! Hi Tim....difficult to recommend something unless we know a little more about your needs and current flying ability. I think the Cub is only rudder elevator, so I guess at the very least a full house aileron equipped model would be your next step. How about the Mentor suggested earlier?...Or maybe you feel a bit more adventurous. Anyways...lets see what response you get on your other thread, as I like to keep this for the raw beginners, and you have obviously passed that stage - congrats! Hi Timbo, I am a newbie in electric modelling and as such I expect to make some mistakes, but I hope this missive will help to prevent anyone making the same mistake as I made today. When I soldered connectors to my ESC and UBEC I ran out of red heatshrink tubing so I covered the connector with a black piece. I connected the power train today (having forgotten about two black connectors) and I am sure you can guess what happened. wires cross-connected and your Magic smoke issuing from the ESC. The moral is always double check before connecting your battery. Ok so we have chosen our project model, and need a bit of help deciding what we need to power it. As with most things in life, there is more than one way to skin a cat. The main factors to determine in the planning stage is the required power in Watts ( a la 100 watts per pound guide etc ) Require 800 Watts ? This can now guide you as to battery cell count as you do not want to be pulling silly Amps through the system.... I usually reckon a maximum of 40A -50A is about tops for most models, with smaller models using considerably less. Therefore, knowing the Watts you can calculate the voltage needed to keep the Amps within those figures. I normally expect each cell in my Lipo pack to hold around 3.5V under load . 800 / 17.5 = 45A Bingo! Assuming the physical size and weight of the 5S / 6S battery, and that it is going to be available, and affordable, you can now start choosing the right motor. We already know it needs to be able to handle at least 800 watts and if we go for the 5S battery, we can choose the right Kv - based on 17.5 volts to give us the required RPM. For a large slow flying "regualr" model this is likely to be around 400 - 800 Kv outrunner depending on prop size required and RPM desired. If however our 800 Watt machine is a fast Jet which is using a high revving fan unit, then the Kv will be a lot higher.... maybe around 1500 -2000 or so, and this will most likely be found in the inrunner section. Looking at motors in that range, specs should show the expected current draw on the required prop / fan on the voltage you will be using. This should be confirmation that your figures are about right. You may of course have to settle on a motor which is slightly off the target regarding Kv and actual currents consumed, but remember, these figures reduce once in the air, and if you end with a slightly more powerful setup than originally planned, you can always throttle back! Going back to crossing over Connections and Smoke etc. by Michael Litherland. I was told at the outset, that you really should have either a 'Polarised' Connector or, if using Torpedo style ones, put a Male one on the Neutral, and a Female one on the Positive, on the Battery and the opposite on the ESC. That way you cannot mix them up!